So here’s a nice secret that I’ll tell you more about tomorrow: I haven’t cooked a thing all week. We arrived home late tonight after lucking out both with the ferry times and the three sleeping children in the car. Smooth sailing of the figurative sort, which we appreciated tonight almost as much as we appreciated the placid waters when we were out canoeing in the lake this morning with a literal boatload of our kids and our friends and their kids. A lovely ending to a lovely week. And not only because I didn’t have to cook. But I couldn’t leave you high and dry (ok, ok, I’m done with the sailing idioms). And I had a little pile of recipes that were waiting for me to tell you about them, so that worked out nicely. I’ve been thinking of this one, a raw broccoli salad, all week. (That’s the thing about not cooking: you don’t have to cook—but you also don’t get to be the cook.) I’ll be making this salad again as soon as broccoli reappears in my CSA box. I’ve probably said this before, but if you think of broccoli as a drab supermarket vegetable, you should really keep an eye out for a crisp, newly-picked specimen at your farmers market. And I implore you not to toss the stems of good broccoli; under the thick peel they’re sweet and crunchy. Dice them into this salad or any salad, or save them to make a soup at the very least. 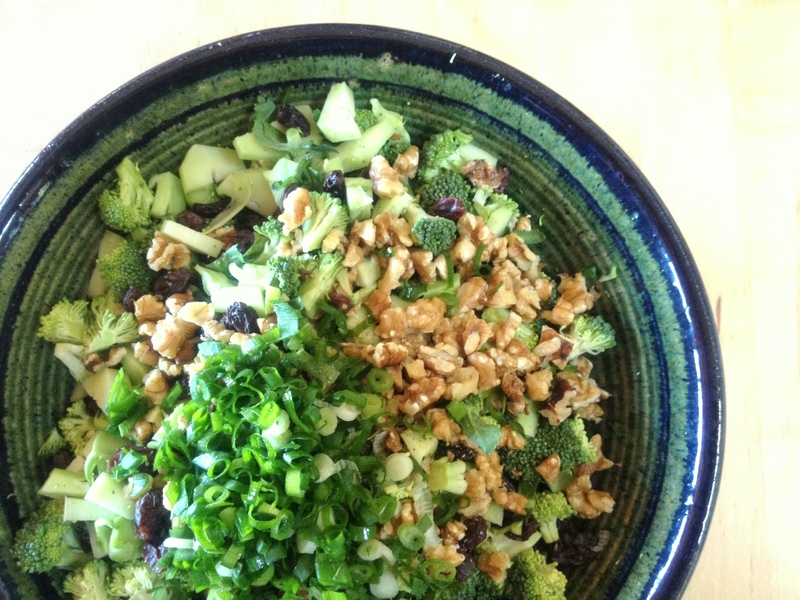 Broccoli Salad with Raisins and Walnuts: Chop a head of broccoli into ½” florets. Dice the tender parts of the stems into pieces of a similar size. Remove a thick layer of peel from the remaining broccoli stalk, then dice it into ½” pieces as well. Toss all the broccoli bits together with a few handfuls each of raisins and walnuts broken into raisin-sized pieces. Add a few tablespoons of minced green or red onion. Anoint liberally with that good honey-mustard dressing; here I used 1 Tbsp. each of honey, Dijon mustard, apple cider vinegar, and olive oil. Stir well and serve or refrigerate. I liked this salad best after it had a few hours to absorb the dressing (I stirred it a few times in the fridge), and it was quite delicious the following day. This entry was posted in Easily Multiplies to Feed a Crowd, Food, Recipes, Salads, Vegan or Would-Be-Just-As-Good-Vegan, Vegetables By Themselves and tagged broccoli recipe, CSA recipes, it's nice to have a vacation from cooking sometimes too, salad, summer recipes on August 3, 2012 by emmycooks. Oh, man. This looks really good! I haven’t cooked in a month. Like really cooked, not like toast or a bowl of yogurt. My final draft is due in 10 days, and I can’t wait to get back into the kitchen. I must be the only grad student ever who LOST weight during the diss! Adding this to my list of freedom recipes . . . Thanks, Emmy! For now, the only thing I can think about is beer. Come and link up to this week’s party when you get a chance…http://inherchucks.com/2012/08/02/whats-in-the-box-37/. Looking forward to seeing you there! Thanks for the invitation–what a fun idea! I encourage others to check it out as well. Your broccoli salad sounds good. I agree, the stems are very tender once they are peeled and should definitely be used. I’m totally making this. Just can’t bear to spend a lot of time in the kitchen right now. We are having our first hot day of the whole summer today, so I am staying out of the kitchen as well–a rare treat for us! I must admit, I make a similar broccoli salad, but add dried cranberries and poppyseeds. YUM! I like broccoli way better raw than steamed! Mmm, I love broccoli salad. This one looks simple and perfect. I like it too–and I like how it lasts for a few days so I can make a big batch and eat it throughout the week! I love salads that don’t include lettuce (I like lettuce but can only eat so much) and this one looks like a crunchy, tasty winner!